Arrr! Ahoy. Shiver me handsome gobbler. It’s yer favorite pirate turkey, Plansky, coming yer way this holiday weekend with me sparklers and sharklers. Aye, me fowl ship has sailed the treachy waters in Grand Lake, infested with the poisonous algae, down the road to Lake Arcadia, a water policed out of fun, onto Lake Thunderbird, where the land lubbers float like so many bilge rats, and then a little stop at Lake Holdercloser, ye get me drift, mateys, wink, wink. Imagine me ship, two hundred pirate turkeys strong, sailin’ with the breezes to bring ye me news, good and bad. Aye, so on with it! Avast, if ye done good, ye get me sparklers, check yer local burn ban, and a cup of me pirate rum from the personal barrel, proof level unknown. If ye done bad, arrr, ye get me sharklers after walkin’ me planks and takin’ a little swim with the toothy fishies. Arrr! Sharklers: Yers truly, me handsome gobbler swayin’ aft in the breeze, starts with U.S. Sen. Tom Coburn, a pirate wannabe, tryin’ to steal yer Medicare coverage and give the treasure to his richies. Arrr, this man calls hisself a doctor, the land lubber, the bilge rat, the swarmy, crawlin’ water spider. . . ye get me drift now don’t ye? Coburny says seniors need to pay more and often so the scurvy uppity ups, yer croissant crowd, can go on shoppin’ sprees, bless their smelly festoons. Arrr! It’s enough to make a pirate turkey’s blood boil, mateys. Here’s Tom’s thinkin’ on the topic: Yer need to deny medical care to create a new program denyin’ medical care. Ponder that load of wannabee pirate talk, take two aspirins and call me in the mornin’. Sparklers: Arrr! Me first sparklers of the season go to the late Clara Luper, the Oklahoma City rights icon, who stood up to yer racist bullies in the fifties to make this schoonerville a better schoonerville. Aye, she’s a legend, a real hero. Her courage leaves a certain pirate turkey in awe. Thanks, Clara, for all yer work. Bless ye. Sharklers: Well, Jim, did ye get the scurvy after the little swim in Grand Lake? Arrr! Sharklers it is to U.S. Sen Jim Inhofe for his continued fight against global warming science. Aye, mateys, I’ve been sailing for many a year, and it’s going on. So poor little Jimmy got some scurvy wurvy in his gullet after a dive in the blue-green algae near his lake house so he says. What’s swarmy about all this is yer climate change has been linked to increased toxic algae. Aye, Jimmy, ain’t it time to drop the bilge rat from yer beak. Come on, lad, drop it. That’s me lad. Good lad thee. Sparklers: A set of me finest sparklers go to OKC’s Cimarron Alliance Foundation, a gay rights group working for equality. At the helm, none other than Scott J. Hamilton, who can distribute his bounty of sparklers to whoever he likes, and there’s aplenty to go around. Arrr! Aye, LGBT Pride Month this year was great cannon fire, me mateys. Scott, thank ye. Take a scoop from me barrel, and enjoy the rum you so deserve. Equality will be ours someday, lads and lasses. Hold yer beaks high, hold em high, higher, there we go. Sharklers: Me last sharklers go to a tricky group tied together by the ankle, stepping limp-by-scurvy-limpity-limp on me planks. Aye, let’s name the land lubbers without further adieu: Aye, it’s Brandon Dutcher, a think-tanky guy, Patrick B. McGuigan, of the right-wing journalism cabal variety, and J.E. McReynolds, the scurvy opinion page leader of The Oklahoman. These rapscallions are playing ring-around-the-rosy to cut retirement benefits for state employees, and they’re duping buccaneers fore and aft who should know better. Here’s their trick: These right-wing musketeers get all blarmey and gobbler-twitchy about a few state fat cats getting the big retirement treasure and then spin it like the whole system works that way. Aye, me mateys, listen, the vast passel of retired employees and teachers here have small pensions. The bone’s already been cut. Leave the regular people alone, musketeers. Shut yer blowhole blarmey, and keep a walkin,’ come on now, just a wee bit more. Splash. Sparklers: Aye, I didn’t want to leave it sour. 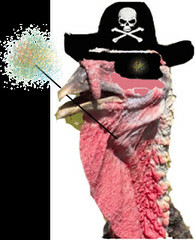 I hereby grant myself sparklers for bein’ the handsomest pirate turkey in Oklahoma. With my gobbler swayin’ and my beak enticing one and all, I wish ye mateys a wonderful holiday with grog and hornpipes galore. Arrr!